The research team has trialled the use of digital sensors in a sample of UK households, correlating measures of location, movement, light and noise levels, particulates, temperature, humidity and device use. Households come in all shapes and sizes, varying in how rooms are organised, devices and energy sourced, how many occupants they have and the purposes for which members spend their time at home. For this field trial we collected data from fixed and mobile sensors, managing the intensive measurement they afford of state, location and activity. The trial is also intended to show how this method, when applied in an intimate setting, affects respondent burden, consent, privacy and data security, and how data can be converted into meaningful descriptions of socially relevant activities in conjunction with questionnaires and interviews, and the 4-day time-use diaries we asked our participants to keep. Mid-January and we have a few more households lined up for participation. Collecting from the last households before Christmas vacation and we now have 13 good ones completed, but we need 20 to meet our target so we now take advantage of Royal Mail to distribute flyers around the Guildford area. Mid-September and a few more installations still to do. Each installation runs for about 10-12 weeks. End of June and the very first households are up and running, and more scheduled for installation in the coming weeks. A Free Day Of Fun, Imagination and Discovery 13 May 2017, celebrated the 50 year anniversary of the University of Surrey. The event attracted thousands of people interested in show-and-tell science, from all across the south of England. The research team operated a full-day demonstration of HomeSense field trial technology, titled: “Making sense of the 21st century household”. This opportunity to engage a public audience in playing around with the sensor suite, observing and discussing with them what the sensors capture, resulted in recruitment of a number of households. End of April and the EGG now gone through a number of design iterations, the last one with added Bluetooth module. With a favourable ethical opinion from the University of Surrey Ethics Committee, recruitment has started with flyers going up around campus, in town, in community centres and online bulletin boards. Not much response so far. The ethics review application is back with questions for us to address. Key issues turn on ensuring an adequately informed consent (and assent) from all types of participants including those who participate indirectly (e.g. children, guests and domestic labourers). Apparently, we didn’t produce an adequate risk-assessment either. A full trial run in a two-person household (couple), knowing that we are still testing for anomalies and unforeseen issues throughout the whole process. For instance, we couldn’t foresee that an EGG ends up on top of an empty box for eggs for support because the wall-mount fails. It’s a long list, the incident list. Routers don’t work, sensors don’t stay put, get knocked down, are badly placed and don’t capture what they are supposed to capture. The consent forms are inadequate, interviews could get a bit awkward, and are we prepared for children, shared households, chaotic lifestyles, dogs, hamsters. etc? Time to take the sensor-suite out of the controlled environment and see how the devices do when they are installed in a house of a generous friend willing to help us out. With a data server and database environment up and running, data transmission tested and encrypted, a design of consent forms, walking interview, questionnaire and time use diary – all in hand – here was a test house to trial ALL our research instruments and discover every which way they can go wrong. Essential testing in order to wrap-up the ethics-review application. By June we were still building, adapting and testing the EGG and how to utilise activity sensors, but the next task is to see if we can adapt the electricity monitoring kit, used by our colleagues working on the WholeSEM project. A good part of May was spent testing a variety of activity wristbands, comparing their measurements on our own arms, and by asking colleagues to wear them over a number of days. Agreement between measures of the medically-graded Actiwatch (blue) and the ~£20 MiBand (green). Building and adapting devices started already in Feb 2016. 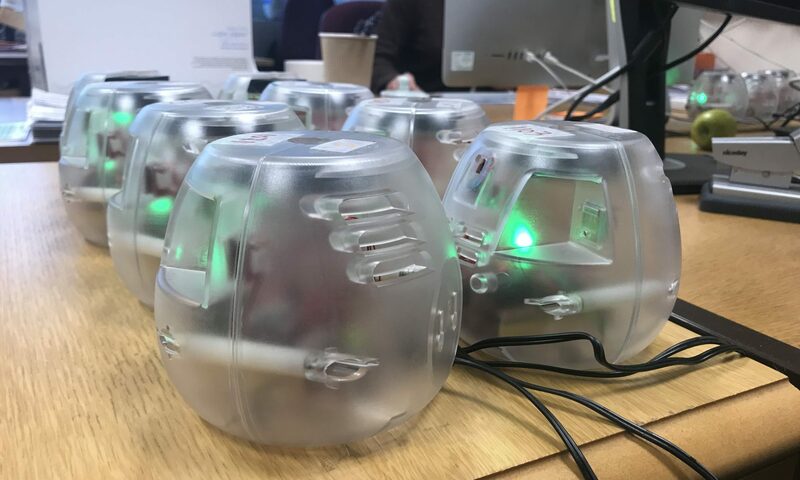 The first task was to get onboard with the development of the WiFi-enabled ICS Desk Egg, to gradually adapt the design to our field trial and thoroughly test the built-in sensors capturing range, particulates, sound, vibration, temperature & humidity, light & gesture.